Staggering Stories - Mr. Dalek: KILL! MAIM! DESTROY! COOKIE? Mr. Dalek’s eye opened. He had hit the side of a bookcase while trying to listen to the conversation. It was over now. Shaggy had left a handwritten note – “So long, soccer!” Mr. Dalek pondered whether to give Shaggy a spelling lesson before extermination. He decided not to. Not when he was in the excellent position to prep a 2% extermination blast, swerve his death arm till the energy beam resembled a Scooby snack, bounce the beam of Scooby death off the bookcase, off the ceiling, off the carpet, and nailing Shaggy with just enough force to kill while he was hiding behind the Scooby van. Yes! Score one for the cleverness of the Dalek empire! Shaggy asked how Mr. Dalek knew his hiding place. Mr. Dalek revealed that it was in The Guardian, who had taken the info from Wikileaks. “Zoinks”, exclaimed Shaggy as he died. The light turns on the reporter, who looks at the audience. Excited, scary mood music is on. Michelle Grade begins: “Good evening. I’m Michelle Grade. Welcome to the expose ‘Apocalypse Then’. That said, remember tonight is Matt Smith night. You could be out at your local Matt Smith Effigy bonfire. The main bonfire from Westminster Abbey is airing live on GOV 1. An encore of last year’s series finale of ‘Who Wants To Be A Billionaire’ is airing on GOV 2. And the encore run of the 775 episode ‘History Of The Cheese’ is up to episode 177 – ‘Gouda’. Michelle: “Are you still here? Seriously? Knowledge of Mr. Dalek and the Staggering Stories were forbidden for 75 years for a reason. People set Mr. Dalek up as a folk hero. He spent most of his life as a useless coward. The one time he did anything interesting – he destroyed the world as we knew it. Our benevolent leadership has rebuilt as best as possible, but for all intents and purposes – that jerk destroyed the world. He had help, and we will excoriate the help as well. But honestly, why give the memory of Mr. Dalek the bother of tuning in for this. Anyone who still wants to duck out and do something more interesting in the next 5 seconds – good on you, mates. Applause is heard around the room. (On screen caption): “With Jason Alexander as Tony Garrison”. Resigned, Adam presses a button and another TV emerges to take the previous TV’s spot on the wall. Fourth TV that week – such a waste. Keith Dunn 224 mysteriously arrives, disposes of the body of 223, and sits down next to his wife Karen. The camera scrolls back to reveal that 25,000 people, including the Staggering Stories terrorists, are all dressed as hedgehogs. Standing united as a stone wall. Little did our traitors know that people were paying attention after all. On 12 January 2011, 75,000 American Doctor Who fans marched at the US Capital Building in Washington, DC, to the bafflement of the newly elected Congress, who at a mere $250,000 annual salary could not afford a cable or satellite package advanced enough to get BBC America. Everybody at the 2011 Gallifrey convention in Los Angeles, CA walked out during a live commentary screening of The Lodger to march on the Los Angeles headquarters of Phony. These 2000 conventioneers were joined by 200,000 facebook friends and shut down traffic in Los Angeles for 12 hours. Reaction to the Los Angeles rally was quick. By 1 March 2011, it was ILLEGAL to produce DVD or Blu-Ray players that were capable of being made Region Free anywhere on Earth – even China. Players that could handle the PAL format were forbidden from handling NTSC, and vice versa. Manufacturers of CD players began work on a project to turn those machines into Region Coded devices. Internet video was also coded to your country of residence – by law. US network BBC America avoided a lawsuit by pulling Doctor Who from the airwaves until the controversy was settled. The PBS stations airing the show followed suit. DVDs were pulled from the shelves – it became illegal to see Doctor Who in the USA. The first, but not the last, country to lose access to that rabble rousing program. As we hear from this April meeting of the Staggering Stories terrorist group, the government reaction was not what had been expected. Mr. Dalek is snapping blackmail pictures. Suddenly two security officers enter. Behind our villains, the TV turns on. Mr. Dalek is shaken from his shock, recognizing that voice. Adam notes that all the TVs and radios have turned on – all to this very familiar man. Mr. Dalek mentions: “Oh dear. I read this speech two days ago on Wikileaks. George has taken over all TV and radio frequencies worldwide. George is going to destroy something of great value to point out that private property doesn’t exist and we should all accept our roles as serfs dually serving the Government and the Phony Corporation. Mr. Dalek points out that he is an alien bent on galactic conquest, not a silly messenger boy. The Staggering Stories should do their own web research. George continues talking on the TV: “I see that my old compatriots at Staggering Stories have turned on me and tried to battle legitimate copyrights. I divorce myself from them and cut off all financial support. Please kill them, British public. I didn’t kill David Cameron and Nick Clegg, but I would have had to if they hadn’t died last night. Their minds were poisoned by my former associates. So sad. George: "We at Phony Corporation have been very patient with consumers and their nauseating belief that they 'own' things. We tried multiple video formats to keep products in certain parts of the world. We tried region coding. We tried enhanced region coding to defeat all region machines. We tried digital rights managements. But you never listen. You always claim that you 'bought' something and should be able to use it wherever you wish for as long as you wish. Well, you are WRONG! Private ownership is a myth, and always has been. We let a few eccentrics in the 18th and 19th Centuries spout their drivel and allowed you to believe it because it used to keep you more docile and compliant. We own the products that we let you 'rent' with the money that the government 'loans' you. Yes, when the government makes the money and stamps it - it belongs to said government. The society has always been a form of a socialist collective. We were just too polite to point it out to you. There is nothing worse than hearing you peasants bleat on and on because we took away or changed something that we used to allow you to use. The products are ours - it is our decision. Given how you destroy everything, we ought to charge you when products are not returned undamaged. George: "Alas, like a spoiled child you have gotten uppity and forgotten who is in charge. So we have to be the grown-ups here and take away some of your toys. I will make a point by taking a way the most insidious concept of private 'ownership' in modern society - gifts you receive from others. Switch to camera two so the serfs can see what happens when they misbehave." The camera cuts to Father Christmas' toy workshop at the North Pole. Rudolph's red nose is starting to flash very quickly. Rudolph reindeers: "Santa! My nose! So much pain!" Father Christmas (aka Santa Claus or Saint Nicholas) worries: "Someone has surgicially removed your nose and put this plastic thing on in its place. Hang on. There's a tiny timer visible in the nose. It's a bomb!" Elves and reindeer start to run around scared, all toy production abandoned. Rudolph yells: "Get away! Save yourself!" Father Christmas, getting out his bomb squad equipment: "There isn't enough time. Our only hope is for me to disarm the bomb before it explodes." Rudolph asks: "How long do we have?" Father Christmas’ line: "Seven seconds." Michelle, on camera: “It took a while to get any cameras going after the Apocalypse. First we lost contact with all satellites around the world. Then communication lines were cut with everybody outside of the British Islands (most of the UK and Ireland). We have not heard from the rest of the world to this day. We operate under the assumption that they all died. Our natively unpleasant environment seems to have partially shielded us. In some ways, dying like the rest of the world would have been better. George points out that he has been poisoned, stabbed, hung, shot, drawn and quartered, drowned, burned – what makes Mr. Dalek think he will be any different in his efforts? Mr. Dalek fires an extermination ray at George. George laughs, until a second ray comes out of the plunger and starts hitting George in the back, trapping George in place. A third ray comes from the eyestalk and starts to kill on the brain. Five more rays appear from various spots and virtually encase George in death rays. Michelle Grade speechifies: “We now cover the efforts to capture and destroy Mr. Dalek and the evil Staggering Stories. You would think they would take a low profile. You’d be wrong. Michelle: “Here’s a photo of the evil Staggering Stories gang visiting the Tower Of London in June 2011. Here they are at Hadrian’s Wall in July 2011. This is a picture of Robert proclaiming that ‘at last, he has an action sequence in a Staggering Stories adventure’, just before we shot him in the back. The audio and video of that scene was not kept. Here they are attacking the Government’s top camera spy. Everybody looks at Mr. Dalek in shock. Mr. Dalek notes: “This is going to take at least 30 minutes.” Mr. Dalek enters the restaurant. Jo! pickpockets the keys and helps the Staggering terrorists escape their bonds. They hide behind a convenient rock where the cops will not look for them. Mr. Dalek begins: “Ok. I’m back from my lunch break.” (Boom) Mr. Dalek looks in horror at the unexploded bomb casing that is now embedded in him. The cops run away in fear. Adam: “Goodbye!” The Staggering Stories terrorists cowardly abandon their colleague Mr. Dalek. At this point some curious cops have gotten close to Mr. Dalek’s shaking body. Mr. Dalek explodes, sending shrapnel over a surprisingly large distance for such a small creature. There is mass death on the streets of London. A five minute montage elapses, showing Mr. Dalek’s death from every possible angle. Michelle, on camera: “Now, you would think that the destruction of their main weapon would slow the Staggering Stories team down. But surprisingly, they chose to rally after Mr. Dalek’s death. Except for Jo!, who disappeared completely. Adam, Andy, Keith, Karen, Jean, and Tony remained out there, causing trouble. Michelle: “The Government was faced with the tragic fact that some of humanity would have to live on while the rest would have to pass away. Complicating this issue was the Staggering Stories terrorists. They preached the doctrine to the public that everybody should be allowed to live. They sent coded messages suggesting that people take boats across the sea to other countries, even though everyone was dead in those regions. It was cruel. Michelle: “We made the choices for population shrinkage considerately. Terrorists had to depart this life first. People with terminal illnesses or who would be drains on society for life. Criminals, naturally. Eventually we had to eliminate science fiction and sports fans, too. Then we had to trim further. Keith declares: “I’ve found Tony!” A disheveled Tony limps in behind him, missing one arm and one eye. Adam has reloaded his gun as the troops surround him. Everybody gets into a cover pose, or an end of series pose. Troops all around, everybody including Adam holding their guns. Adam grins a sardonic grin, and practically strums the trigger like a guitar string. Fade to black as we hear shots, but don’t see anything. Michelle Grade, in studio: “And that is the end of the film. The end of Mr. Dalek and the evil Staggering Stories gang. Did it convince the naysayers that these people were killers, cowards, and cheats? Well, it doesn’t matter. This broadcast was a honey trap. Anybody who tuned in was clearly a dissident who need to be sent to the mines to help dig our way to the landmass once known as France. At this point, Michelle notices something odd. There is an odd sort of banging from INSIDE the stand holding the main studio camera. Her eyes open wide as a small, impossible creature bursts out from the framework. “PUPPY POWER!” yells the intruder. You the readers recognize this creature as Scrappy Doo, though Michelle Grade would have no clue who the wee beastie is. The figure emerges – it is a hybrid creature – the top half is Tony Gallichan! The lower half is the base of a Dalek. And Tony has both of his eyes. Michelle Grade reaches for the alarm button in alarm, but it is exterminated by a figure in another direction. Keith Dunn, half-Dalek like Tony. Entering the room shortly thereafter are Andy Nunney and Adam Purcell, also half-Daleks. Behind them all – Mr. Dalek! Adam tries to press the button. 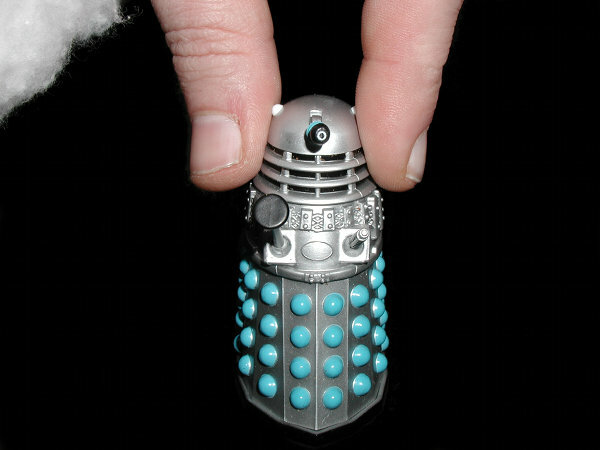 Mr. Dalek exterminates the button, destroying Adam’s right hand. Mr. Dalek exterminates Adam at full blast, destroying him as quickly as possible. So, with new team member Michelle Grade in tow, the Staggering Stories team and Mr. Dalek stroll out of the studio, heading out into the brave new world. Doctor Who is a BBC Trademark. This is a work of fan fiction, a bit of fun that will not generate any money. Though since I’m having to do this disclaimer anyway, it is simply ludicrous that a Beatles performance which only survives due to The Chase is censored from the DVD release of The Chase. The lawyers should have been more reasonable and come to an agreement to release the story unmolested.